Several major airlines in Vietnam have showed their ambitions to expand their operations in many new international routes in the time to come. Vietnam Airlines currently holds 40% of the market share in international routes. The national- flagship carrier plans to open several international flight routes this year, including several routes to Japan such as Hanoi - Haneda, Danang - Tokyo, and Danang - Narita as well as one route from Vinh to Laos’ Vientiane. The airline plans to increase the frequency of several international routes in order to meet increasing market demand such as Hanoi - Fukuoka (Japan), Hanoi - Beijing (China), HCM City - Narita (Japan) and HCM City - Beijing. 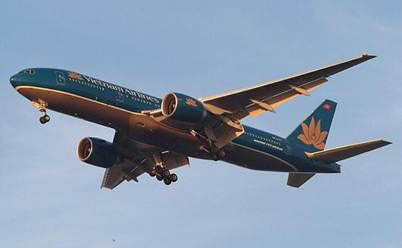 According to Vietnam Airlines, there is currently a fierce competition in the international aviation routes to Vietnam due to the recent mushroom of many aviation firms from the Middle East. These rivals have advantages over local airlines as they own a wide flight route network in many major cities in Europe. They often gather passengers in the Middle East to Vietnam with a frequency of seven flights per week. Meanwhile, Vietnam Airlines currently has only four flight routes to Western Europe including to Paris, London, Moscow and Germany’s Frankfurt. Jetstar Pacific Airlines (JPA) also plans to expand their operations in foreign routes. “We’ll launch two new flight routes to Macau at the same time including Hanoi - Macau and Danang - Macau with a frequency of one flight per day. In April, we also open more new international flight routes from Hanoi to China’s Hong Kong, Thailand’s Bangkok, HCM City to Singapore and HCM City to Hong Kong,” JPA’s General Director Le Hong Ha said. According to Ha, these are the busiest flight routes in the Southeast Asian region but they are facing fierce competition with several strong international rivals like Singapore Airlines, Thai Airways, Cathay Pacific, and Air Asia. In order to prepare for the plans, JPA has been speeding up its restructuring process over the past year. It has changed the old Boeing 777- 400 airplanes to more popular Airbus 320 in order to save expense and to increase its competitiveness. Meanwhile, VietJet Air (VJA) will launch many new international flight routes with duration time of less than three hours to Singapore, Taiwan, Hong Kong, China’s Kunming, Myanmar, South Korea’s Seoul, and Japan’s Fukuoka and Osaka. Flight routes to South Korea and Japan are expected to be opened in the second half of this year. Initially, VJA is considering increasing the frequency of the Hanoi - HCM City flight route to 14 flights per week. Its capacity is expected to significantly increase when its joint venture with Thailand’s Kan Air starts operation with five local flight routes and two to three international flight routes in the South East Asian region. Recently, VJA has signed a major contract to buy and hire a total of 100 new A320 airplanes from Airbus. The delivery will be conducted from now onto 2024. The Civil Aviation Administration of Vietnam said that all airports in the country welcomed over 40 million passengers including 29.5 million passengers carried by local airlines in 2013. To date, 45 foreign airlines have opened flight routes to Vietnam with a combined 71 flight routes frequently to 22 countries and territories in the world annually.